Ages 8 and up. 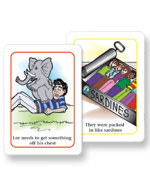 Use the full-color 2.5"x 3.5"cards in this deck to teach common idiomatic expressions. 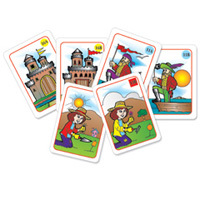 Use the 350 colorful cards in this set to teach basic vocabulary. Ages 5 and up. 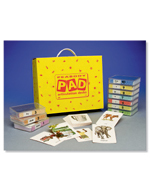 Challenge your students to describe similarities and differences. 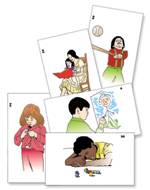 Ages 4 through 10. 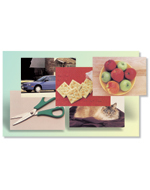 Use these five beautiful 11"x 17"picture scenes to stimulate language development as children talk about each situation. 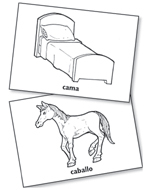 Use these clear line illustration to teach Spanish speech sounds. Ages 8 through 17. 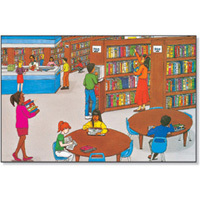 Watch students blast off into original stories with the 52 picture cards in this set.